Unique Adventure designs combined trekking to one of the the stupendous peaks- Island peak with Three passes trek. Island Trekking Peak (6160m. ), one of the most famous and certainly most invigorating trekking peaks in Nepal and in the whole world is also named as Imja Tse peak. Imja Tse will enthrall you with its fabulous scenery and most appreciably, you will get a standardized viewpoint to watch the world's uppermost peak- Mount Everest. 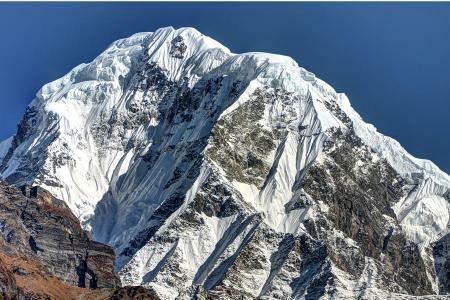 Magnificent panorama of immense Himalayas like Lhotse (8,501m. 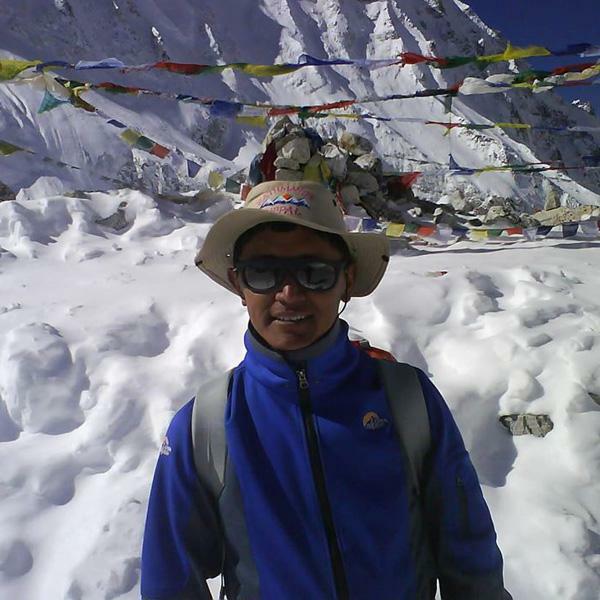 ), Nuptse (7,879m. ), Lhotse Shar (8,383m. ), Makalu (8475m. ), Lhotse Middle Peak (8,410m.) 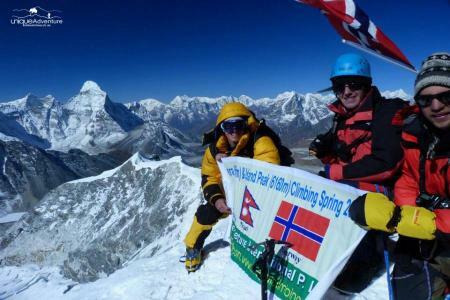 in the east, Amadablam and Baruntse in the south welcomes you as you reach the Imja Tse Peak. After thriving way up to the peaks we go round to the three passes named as Cho La Pass, Kong Ma La Pass and Renjo La Pass. The breathtaking Three Passes Trek is proposed for those trekkers who endeavor to cross Everest high passes with no any technical climb. The trek bestows a superb experience of discovering natural glory, physical glory and extreme cross-cultural multiplicities. 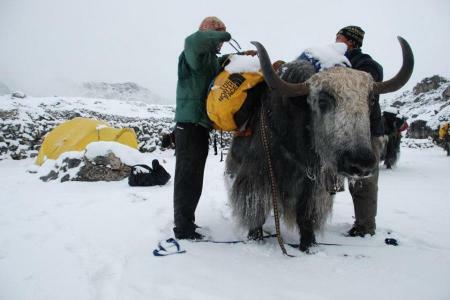 The Sherpa residents of Khumbu, the immense valley beneath Mount Everest, regard all things - mountains, animals, plants etc. are blessed. Also, the Three Pass Trek will offer a chance to witness Thame (3200m. ), Renjo-la pass(5357m. ), Lungden (3800m. ), Gokyo-Ri (5357m. ), Cho-La pass (5380m. ), Thangnak (4680m. ), Gorakshep (5170m.) , Everest base camp (5400m. ), Kongma-la pass (5535m.) and more. Moreover, on the way you can take pleasure in seeing various floras like pine, hemlock, fir, juniper, birch and rhododendron woods. This Island Peak Climb with Three Passes Trek designed by Unique Adventure is fairly technical while climbing peak and you can enjoy the amazing views of North crest of Mt. Amadablam and the broad line of Mt. Nuptse in conjunction with Mt. Lhotse the world's third uppermost peak as well as three passes - Cho La Pass, Kong Ma La Pass and Renjo La Pass. Day 01 : Meeting upon arrival in Kathmandu International Airport by our representative, transfer to hotel. Soon after your arrival at Kathmandu International Airport, we meet our Nepali representatives who will clarify us about the tour. After the short description by our representatives, we are sent to our Hotels where we will be staying overnight. Day 02 : Stay in Kathmandu for the official procedure, overnight at hotel. We take a charming flight from Kathmandu early in the morning to Lukla (2827m. ), we fly for 40 minutes. Arriving at Lukla, in the afternoon, we start our stroll by moving down to the Dudh Kosi River and take the key track to Namche Bazaar, located just over Chaunrikharka (2713m.). Overnight in Lodge. The path is trouble-free and after coming across the tiny village of Ghat (2550m.). We will walk downward to the Dudh Koshi River, where we connect the major route to Namche Bazaar. After passing via the small community of Ghat (2550m. ), we reach at Phakding. Overnight at guest house. Day 05 :Trek to Namche Bazaar (3440meters), overnight at lodge. Day 06 : Rest in Namche Bazaar for acclimatization (day hike to Syangboche), overnight at lodge. We have a rest day today to become familiar at a elevated height in Namche Bazar. Namche is a accepted village positioned in a great sheltered hollow. On top of the village, there lies the national park headquarters where one can take the chance to view both the gripping sunrise and sunset views. 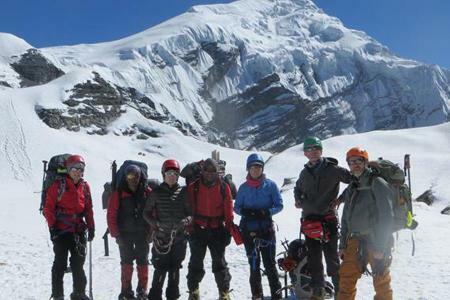 The amazing panorama includes excellent scenery of the Khumbu peaks and impressive views of Everest. After breakfast, optionally, we can either go for a hike towards Thami (3810m.) over the eye-catching Bhote Khola River Valley or go to the national park headquarters to view the exclusive Sherpa lifestyle . Or you can hike to Syanboche. Overnight at lodge. Day 09 : Trek to Chhukung (4730meters), overnight at lodge. 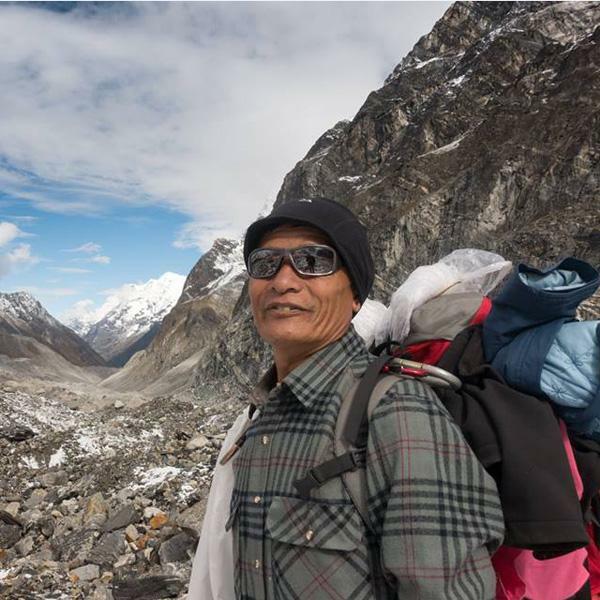 We ascend to Chhukung Ri, a rock-strewn peak over the community of Chhukung in the Khumbu region. 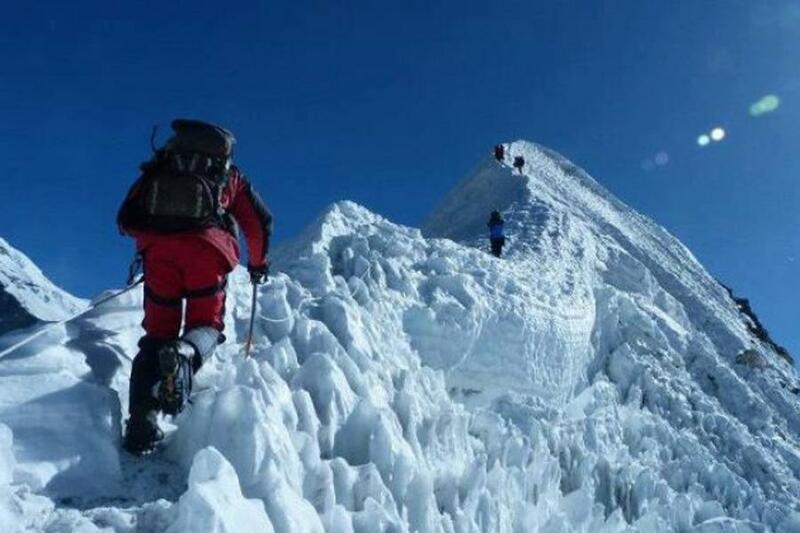 It takes around 3-4 hours to get there to the summit from Chhukung and it needs no technical skill. The peak bestows wonderful views of Imja Tse, Ama Dablam, Makalu and Nuptse. Then we go back to Chhukung. Overnight at lodge. Day 11 : Trek to Island Peak Base Camp (4970meters), overnight at tented camp. We will start ascending early to arrive at the summit and our route now gets complex once we arrive at the foot of the pointed icefall below the peak. Great care has to be taken while ascending the wall to reach on the edge which leads to the summit. After getting to the summit, you will move down to the Island Peak Base Camp. Day 14 : Summit Island Peak (6160meters) and back to Chhukung, overnight at lodge. In the early morning, we will begin our climbing to arrive at the summit. Our trail will get complicated once we reach the bed of the pointed icefall beneath the peak. In order to succeed, great caution must be implemented while balancing the barrier to approach out on the rim leading to the summit. After we reach the summit, we will be back to Chhukung. Day 15 : Extra day of summit Island Peak in case of bad weather. Day 16 : Trek to Lobuche after crossing Kong Ma La Pass (5535meters), overnight at lodge. 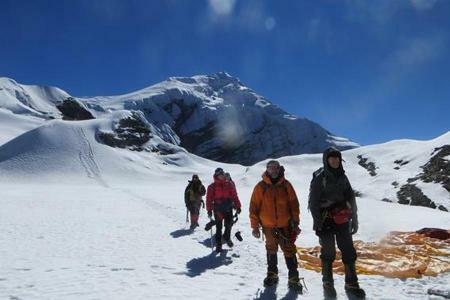 Keep on trekking along the moraine of the glacier with the views of Kala Patthar (5,545m.) and Mt. Pumori (7,165m.) we hike today high above the Pheriche village. Also we will come across Kong Ma La Pass (5535meters). Pretty normal day today takes about 4 hours walking to reach Lobuche. Rest of the day we may take simple hike around. Day 17 : Trek to Everest Base Camp and back to Gorakhshep, overnight at lodge. This is another challenging day. We walk along the Khumbu Glacier and up to Everest Base Camp at 5365 m, the closest you can get to Mt. Everest without climbing equipment. The view of the Khumbu Icefall from Base Camp is spectacular. A steady way up permits us to build the slow, steady pace necessary when walking at high height. When we arrive at the moraines of Changri Nup Glacier, we make a sequence of small up and down walking over a unsteady track lined with cairns that shows the way ultimately to the unexpected glacial sands of Gorak Shep (5160m.). And then, we consequently, head off towards the Everest Base Camp. Then we will return back to Gorakhshep. Day 18 : Climb Kalapatthar (5545meters) for close Everest view and trek to Lobuche, overnight at lodge. This day is one of the most difficult yet worthwhile days of the trek. In the morning we spend climbing Mount KalaPatthar (5545m.). The climber gets the most wonderful mountain panorama: Everest, the highest point on the planet at 8848 meters, tower directly to the front and on all sides come into view, the other giants, Nuptse, Pumori, Chagatse, Lhotse and countless others. And, then we will trek back to Lobuche. Overnight at lodge. 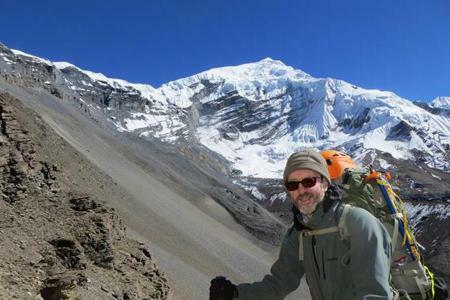 Day 19 : Trek to Dzonglha (4840meters), overnight at lodge. Our trail takes us to Dzonglha which moves away from the major path after some distance from Lobuche. After going across a stream we come all the way through a division and later twist round to the wide grumpy river bed. Now, the track runs diagonally and goes up the circumference in front. From the green ridge in front, we can see soaring heights of Ama Dablam, angtega-Thamserku and more while Tawache appears terrifically. Pheriche village is also visible down in the valley ground. As the ridge modifies direction to the North, the enormous Cho La Lake expands below Mt. Cholatse. The lake pours with us over a long way until we move downward to a wide base. The trail moves down steeply to broader basin. After walking for half an hour we go across a wobbly bridge and we reach Dzonglha. We stay tonight at Dzonglha. Day 20 : Trek to Thangnak (4695meters) after crossing Cho La Pass (5380meters), 8hrs, overnight at lodge. Today, we descend to the lake and move further downward to the glacier. The trail crosses the glacier which is marked by cairns. After crossing Chola Pass, we walk for 2 hours today. And overnight at Lodge. Day 21 : Trek to Gokyo (4755meters), 3hrs, overnight at lodge. On this day we hike observing the lakes at Gokyo which pours down to the western division of the Ngozumpa Glacier. We go diagonally through the three outstanding lakes and traverse the third lake, Dudh Pokhari and on the East bank we can mark the community of Gokyo. Walking beside the lake, you will discern the view of splendid summits of Cho Oyu and Gyachung Kang. We will stay overnight at lodge. Day 22 : Climb to Gokyo Ri (5420meters) for the view of Everest Cho Oyu etc, overnight at lodge. Today we begin trekking early taking about 2 hours to reach Gokyo Ri for striking sunrise view over Mt. Everest, Nuptse, Lhotse, Amadablam and other several huge peaks. And the sight perceptible from here is superior to the image from Kala Patthar. Overnight in Gokyo at lodge. Day 23 : Trek to Fifth Lake for the glacier and lakes views and back to Gokyo, overnight at lodge. Day 24 : Trek to Lungden after crossing Renjo La Pass (5388meters), overnight at lodge. We go away from the main path and cross Renjo La track by Dudh Pokhari. We get to to the Renjo La after about 3 hours where an unbelievable panorama lies ahead. The Everest, Lhotse, Cholatse, Taboche can be seen splendid in the sun. Captivating image of ice on the path while moving down can make our way down a bit dangerous. Beside the way, we observe Relama Tsho and Renjo Lake. We march more or less for one from Lungden (4350m.) Overnight in Lungden. Day 25 : Trek to Thame, overnight at lodge. Walking down to Thame today, we use a usual route used for centuries by the Tibetan trader. Moving down, we cross the Bhote Kosi and the way over again drops to Taranga. The path then goes all the way through the valley of Langmuche Khola. We trek downward after going across a bridge after then lastly reach Samde. The place presents wonderful views. The lane abruptly descends down to Thame village. Overnight at lodge. Day 26 : Stay rest in Thame and explore around, overnight at lodge. At Thame today, you have a day rest after a long day trek. Here we can go around Thame and see beautiful natural views as well as visit a monastery called Khari Goma. Overnight at Thame again. Day 27 : Trek to Khumjung, overnight at lodge. Today we will trek to Khumjung Village, a highly famous Sherpa village in the Khumbu Region, offer the most popular trekking in the world. Overnight at Khumjung. Day 28 : Stay at Khumjung and Explore Khumjung and Khunde Village, monasteries, overnight at lodge. Staying at Khumjung Village trekking passing all the way through the rhododendron forest, Sherpa village pasture of barely, apple orchards, Buddhist Monasteries while climbing and moving down Khunde Village and walking via beautiful picturesque views will be memorable forever. Overnight at lodge. Day 29 : Trek to Namche Bazaar, overnight at lodge. Today, we make our way down through birch and rhododendron forest to Namche Bazaar for couple of hours. Tonight at guest house in Namche. Day 30 : Trek to Phakding, overnight at lodge. After having our breakfast, today we go back over the major road down to Dudh koshi retracing to Phakding. Overnight at Lodge. Day 31 : Trek to Lukla, overnight at lodge. Following the track, we arrive at Lukla scaling different Sherpa villages crossing a suspension bridge above Thado Koshi. For about 45 minutes, we go up to accomplish the whole trail and we reconfirm flight ticket and see off to local porters. Day 32 : Fly back to Kathmandu, overnight at hotel. After travelling for 35 minutes, we fly back to Kathmandu from Lukla in the morning and move back to the hotel. Rest of the day we can lighten up. Day 33 : Leisure day in Kathmandu, overnight at hotel. Day 34 : Transfer to airport, departure onward destination. Cosy guesthouse and Tented camp accommodation whilst on trekking and climbing. Internal flight Kathmandu – Lukla – Kathmandu inclusive with airport tax. Highly experienced trekking porter/s to carry luggage. Exclusive First Aid Medical Kit, Oxymeter to check the pulse and heart rate at higher altitude. International airfares, extra baggage and cargo charges. Travel and medical insurance (for emergency evacuation if needed). Personal expenses, bar and beverage bills. Note: You can bring the necessary gears from your own country or can buy or hire from the stores at Kathmandu or Chhukung.